In the UK support for LVT can be found in all the major political parties. At the 2017 General Election the LibDems, the Labour Party and the Green Party all included LVT in their manifestos. ........Reviewing the Business Rates system, prioritising reforms that recognise the development of the digital economy, lessening the burden on smaller businesses, and ensuring high streets remain competitive. We will also consider the implementation of Land Value Taxation. For more information about the appearance of Land Value Taxation in the 2017 election see here. The CEJ has been engaging with a number of figures to promote the idea of using land rent for public revenue. Leading political figures who have been advocating LVT recently include Jeremy Corbyn, Leader of the Labour Party, John McDonnell Lab MP and Shadow Chancellor, Vince Cable MP, Leader of the LibDems and Nick Boles Cons MP. Andy Burnham Mayor of Manchester included LVT in his 2015 Labour Party leadership bid. Senior members of the Green Party, MP Caroline Lucas, Baroness Jenny Jones and MEP and economic spokesperson Molly Scott Cato all support the policy and have spoken of its advantages. This cross-party support for the policy has led in December 2017 to the formation of an All Party Parliamentary Group (APPG) on land value capture. In February 2016 the Planning Committee of the London Assembly published a report entitled A Land Value Tax for London which explored the possibilities of adopting such a tax in the capital and examined in particular how it would improve the housing situation. It received a favourable response from Mayor Sadiq Khan in November and with the release of the London Finance Commission Report in January 2017 the idea was given a further boost by Tom Copley Chair of GLA Housing Committee. The CEJ is at present conducting research in tot he Viability of using land value capture in the Old Oak Common Development as recommended in these reports. Many think tanks on the left of the political spectrum including the Fabians, CLASS, Compass, and Progress have published literature supporting annual Land Value Tax. From the opposite side of the political spectrum The Institute of Economic Affairs the and Adam Smith Institute also recognise the efficiency of this form of collecting public revenue. The Mirrlees Review, a comprehensive review of the British tax system produced by the Institute of Fiscal Studies, explains fully the benefits of shifting taxation onto location values. For a full review of support for taxing land values from the right of the political spectrum see this review by Paul Knight. The concept of LVT is not new in the UK, and has had significant support over the past century - perhaps the most well known historical advocate being Winston Churchill. 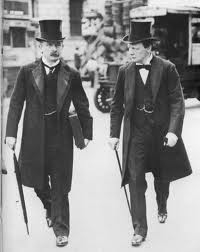 Lloyd George, included a diminished version of LVT in his 1909 People’s Budget and in 1931 the Labour Government included LVT in their Finance Act but when Ramsay McDonald formed a National Government with Conservatives, to tackle the economic crisis, one of their first decisions was to discontinue the land valuation making it impossible to collect LVT. The 1935 Conservative Government took LVT off the statute book. Herbert Morrison also moved a Private Member’s Bill in 1939 calling for the Site Value Rating (local LVT) of the LCC. In 1985 Tony Benn promoted a Ten Minute Rule Bill in Parliament calling for “The Common Ownership of Land” and suggesting the creation of a Community Land Trust to collect land rent. In 2013, Caroline Lucas, Green MP, moved a Private Member’s Bill (with Lab and LibDem MPs supporting) calling for a study of the benefits and practicality of LVT. In recent times there has been much discussion in the press about LVT. The Financial Times has carried articles promoting LVT by Nick Boles (now a Conservative Minister), Sir Sam Brittan and Martin Wolf. Similarly The Guardian, The New Statesman, The Economist, Tribune and other publications have published articles supporting LVT by George Monbiot (environmentalist), Andy Wightman (Scottish land reform campaigner and now MSP representing the Scottish Green Party), Richard Murphy (Tax Research UK), Will Hutton (political economist and former Chief Exec of The Work Foundation), Merryn Somerset Webb (Editor of Money Week), Phillippe Legrain (economist and author), Larry Elliott (The Guardian’s Economics Editor) and Polly Toynbee (journalist and former BBC Social Affairs Editor). The OECD, The World Bank, UN Habitat and other international organisations have drawn attention to the benefits to be gained from adopting LVT. A number of countries such as Denmark, Estonian, Hong Kong and Taiwan utilise land values to help their economies. Local Authorities in parts of Australia, New Zealand and North America have all adopted local forms of land value taxation. 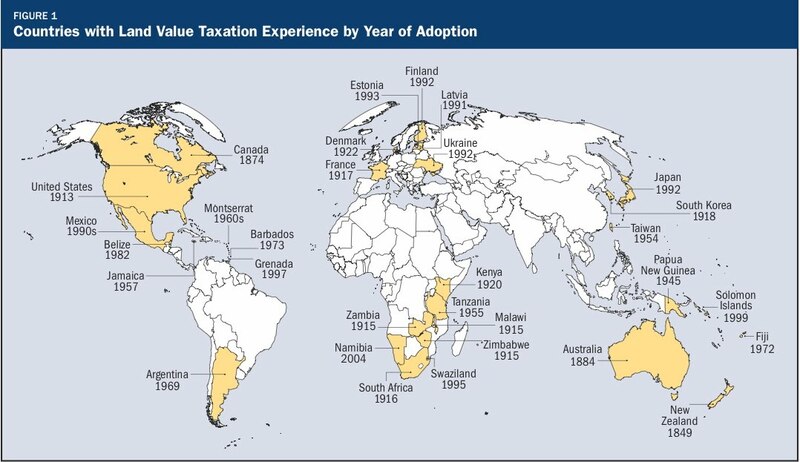 The map below show countries that have adopted land taxes in various forms with the date of adoption. Source: Dye and England (2009) Land value Taxation: Theory, Evidence and Practice, Cambridge, Ma, Lincoln Institute of Land Policy.